As autumn rains return to Jackson Bottom Wetland Preserve in Hillsboro, everything begins to change. In the summer, this preserve is all but bone-dry, and the main visible wildlife are small amphibians and a handful of big birds. But the marshes and ponds will be teeming with life over the next several months. The city of Hillsboro — along with Metro, Clean Water Services and other organizations — is looking to restore a self-sustaining seasonal wetland and erase decades of misuse in Jackson Bottom, a 270-acre preserve along Hillsboro's southern border. The land has been used in different ways over the years, said Lori Prince, Hillsboro's outdoor recreation manager. "It's gone through farming and tiling and draining, and it's been used as a cannery waste operation site." Clean Water Services, the sewer authority for Washington County, also used the floodplain as a test site for wastewater reclamation. Biologists hope by the time the restoration is completed, Jackson Bottom will retain floodwater later in the year, allowing for more native plants to thrive. The wetland will be seeded with native plants, which should encourage native animals to return to the area. By the 1930s, farmers dug drainage ditches on the site, said biologist Laura Trunk. When the wetland flooded each year, it would quickly drain so farmers could use the land earlier in the spring. The bones of past projects still remain: plastic pipes crisscross the wetlands in places and there are remnants of a failed settling system and a floating sewer line. 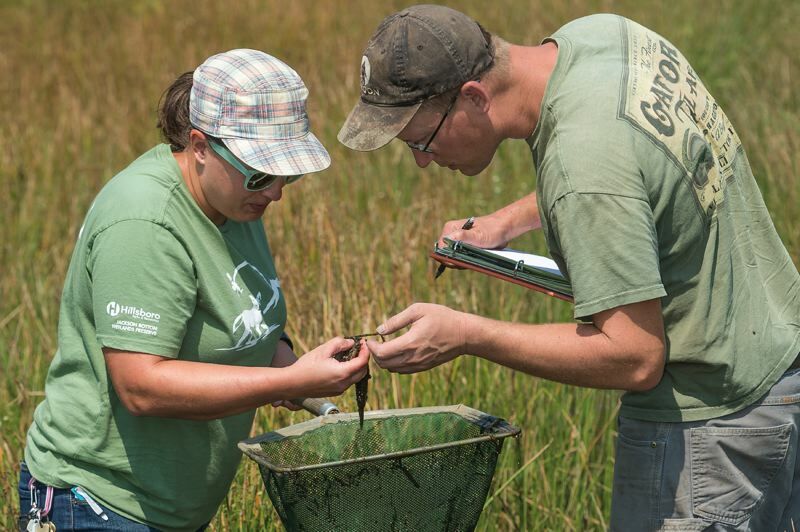 Two marshes Trunk and fellow biologist Chris Rombough are studying— Oak Island Marsh and the Northwest Pond — fill up each winter and drain each summer. Oak Island takes some storm runoff from Hillsboro, meaning it rarely drains completely. 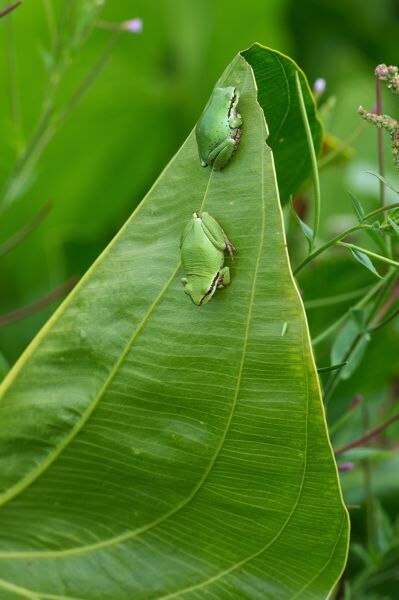 Even in the summer, Northwest Pond is littered with large green wapato leaves crawling with small frogs. The Oak Island Marsh is free of vegetation, save for thin patches of grass. Why is the Northwest Pond full of plants and Oak Island barren? Native to Europe and Asia, carp are considered invasive in the Northwest. Yet Rombough said carp are one of the most widespread freshwater fish on the globe. Unlike native species, carp tend to eat all the vegetation in the wetland and leave a muddy wasteland. The Northwest Pond dried out in 2015 and 2016, eliminating the carp, but Oak Island Marsh held water and the carp survived. "Our ultimate goal, because we can't ever stop invasive species from coming on to the site, is they at least dry out every year or every other year," Trunk said. "Basically, they're kept under control instead of getting out and destroying all the vegetation." With native vegetation back in place, Trunk said, she's hoping to see other species move in, such as amphibians like frogs, which are fed on by garter snakes and wading birds like herons, as well as species of waterfowl. It will cost about $1.2 million and take five years to restore the site back to its original state, Trunk estimated. "That's including volunteer hours and donations and staff hours," Trunk said. "It's a lot of money. Construction alone will be about $400,000." Trunk said the planning process with Clean Water Services began three and a half years ago, and she began applying for multiple state and federal permits two years ago. Metro awarded a $335,000 grant for the project, and Clean Water Services is helping fund restoration efforts. Hillsboro is spending money on staffing — Trunk is paid by the city — and project organizers have been busy writing grants to fill in the gaps. "Think about the future," Prince said. "Come back 10, 15, 100 years from now, and the impact of the work being done today is going to live on for generations. That's why they're doing the work, to be sure it's done right, doing the research leading up so the mistakes made in the past are not redone." The Wapato Marsh, a large section at the center of Jackson Bottom, was once a field of canary grass — 6 feet tall and so thick in places that biologists dug through 18 inches of canary peat to reach the natural soil. Now, after several years of restoration work, the marsh supports between 50 and 60 native species, Trunk said. The native plants have brought scores of birds. The number of species at Jackson Bottom has exploded since 2012, including a pair of sandhill cranes, breeding bitterns and northern pintail ducks. "When this thing floods up," Rombough said, "it'll be just a sheet of ducks."